Dumfries and Galloway host a variety of gardens, many warmed by the Gulf Stream. Port Logan (14 miles south of Stranraer). A fabulous array of bizarre and beautiful plants, including many sub-tropical species which& flourish under the influence of the Gulf Stream in 'Scotland's most exotic garden'. Open March - October. 10am-6pm (5pm in March & October). Admission charge. Situated at Castle Douglas. The National Trust for Scotland's School of Practical Gardening takes post-graduate students and trains them in estate gardening. The gardens offer wonderful displays of daffodils, azaleas, herbaceous perennials and a walled garden still producing the vegetables, fruit and flowers it was designed to do. Threave Estate is a wildlife refuge with walks, hides and nature trails. Estate and Garden open all year. Threave House offers a fascinating insight into life in the 1930s in a country house built in the 19th century in the Scottish baronial style. House open April - October. Admission charge. National Trust for Scotland. Drumlanrig Castle Gardens & Country Park near Thornhill. 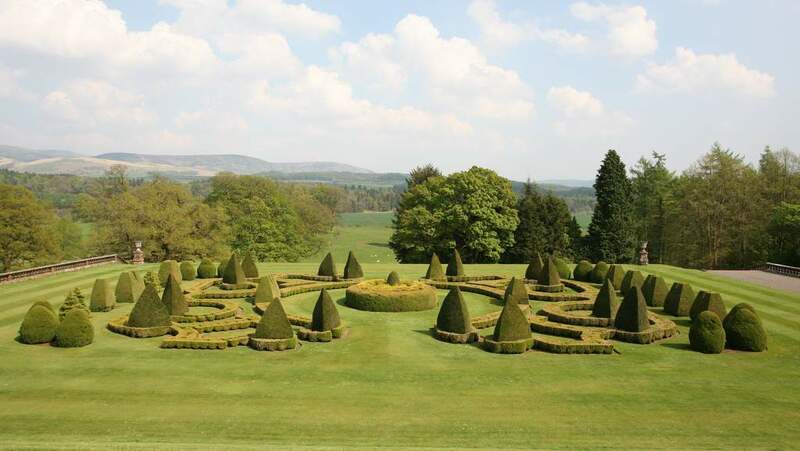 Extensive formal landscaped gardens on an impressive scale. Large parterres, woodland gardens, rare conifers, specimen trees. Victorian greenhouse, vegetable garden and plant centre. Open for April to September. 5 miles east of Stranraer. 75 acres set between 2 large lochs and 2 castles. Walled garden, 2-acre lily pond, a pinetum, landscaped terraces and avenues. Rhododendrons, azaleas, embothriums, herbaceous borders. Tea room, plant shop and gifts. Open from Easter - end September. 12 acres of outstanding gardens overlooking the sea at Luce Bay not far from Stranraer. Glenwhan Gardens feature acid loving plants so wonderful rhododendrons, magnolias, eucalyptus, orchids, hostas and lilies. Inspired by Logan Botanic Gardens the Knott family have created Glenwhan Gardens over the past 30 years with colour for every season, Glenwhan has winding trails leading past water features and carefully dotted sculptures to add interest. If you have time there is a wildflower walk stretching over 17 acres with mown paths leading past densely packed patches of colourful; grasses and summer blossoms. Open daily 10am - 5.30pm from March to October. Licensed Tearoom. Near Gatehouse of Fleet. Walled garden with over 4,000 perennials. Nursery. Open Easter to end September (closed Mondays and weekday mornings).